Abdullah Öcalan (/ˈoʊdʒəlɑːn/ OH-jə-lahn; Turkish: [œdʒaɫan]; born about 1947), also known as Apo (short for both Abdullah and "uncle" in Kurdish), is a Kurdish leader and one of the founding members of the militant Kurdistan Workers' Party (PKK). From prison, Öcalan has published several books, the most recent in 2015. Jineology, also known as the science of women, is a form of feminism advocated by Öcalan and subsequently a fundamental tenet of the Apoist movement. Öcalan's brother Osman became a PKK commander, serving until defecting with several others to establish the Patriotic and Democratic Party of Kurdistan. His other brother, Mehmet Öcalan, is a member of the pro-Kurdish Peace and Democracy Party (BDP). Dilek Öcalan, a former parliamentarian of the HDP is his niece. Ömer Öcalan, current member of parliament for the HDP is his nephew. After his capture, Öcalan was held in solitary confinement as the only prisoner on İmralı island in the Sea of Marmara. Although former prisoners at İmralı were transferred to other prisons, more than 1,000 Turkish military personnel were stationed on the island to guard him. A state security court consisting of three military judges was convened on the island to try him. Öcalan was charged with treason and separatism and sentenced to death on the 29 June 1999.In the same verdict it was declared he was banned from holding public office for life. In January 2000 the Turkish government declared the death sentence was delayed until European Court of Human Rights EU had reviewed the verdict. Upon the abolition of the death penalty in Turkey in August 2002, in October 2002 the security court the sentence was commuted to life imprisonment. The Kurdish Human Rights Project (KHRP) may have aided this case's decision. Since 27 July 2011 his lawyers have not been allowed to see Abdullah Öcalan. There are regular demonstrations held by Kurdish community to raise awareness of the isolation of Öcalan. In October 2012 several hundred Kurdish political prisoners went on hunger strike for better detention conditions for Öcalan and the right to use the Kurdish language in education and jurisprudence. The hunger strike perdured 68 days until Öcalan demanded its end. The lawyers have appealed 700 times for visits, but all were rejected. Öcalan was banned from receiving visits almost two years from 6 October 2014 to the 11 September 2016, when his brother Mehmet Öcalan visited him for Eid al-Adha. Then again he was banned from receiving visits until 12 January 2019 when his brother Mehmet Öcalan was again permitted to visit him. His brother said his health conditions were good. In 2008, the Justice Minister of Turkey, Mehmet Ali Sahin, said that between 2006 and 2007 949 people were convicted and more than 7000 people prosecuted for calling Öcalan "esteemed" (Sayın). 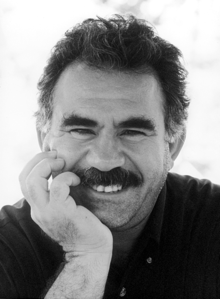 Since his incarceration, Öcalan has significantly changed his ideology through exposure to Western social theorists such as Murray Bookchin, Immanuel Wallerstein, Fernand Braudel, and Friedrich Nietzsche (who Öcalan calls "a prophet") Drawing heavily on Bookchin's libertarian socialist idea of communalism, Öcalan fashioned his ideal society of "democratic confederalism". He also wrote books and articles on the history of pre-capitalist Mesopotamia and Abrahamic religions. Öcalan attempted in early 2004 to arrange a meeting with Murray Bookchin through his lawyers, describing himself as Bookchin's "student" eager to adapt his thought to Middle Eastern society. Bookchin was too ill to accept the request. In May 2004 Bookchin conveyed this message "My hope is that the Kurdish people will one day be able to establish a free, rational society that will allow their brilliance once again to flourish. They are fortunate indeed to have a leader of Mr. Öcalan's talents to guide them". When Bookchin died in 2006, the PKK hailed the American thinker as "one of the greatest social scientists of the 20th century", and vowed to put his theory into practice. ^ Normally, students can only transfer between like departments, otherwise the student must retake the university entrance exam. Moreover, Öcalan was awarded a scholarship by the Ministry of Finance, despite being ineligible due to his age, and the fact that he had participated in political demonstrations. He had also been tried and acquitted by a martial law court. The public prosecutor had asked for the harshest possible sentence. ^ "Profile: Abdullah Ocalan ( Greyer and tempered by long isolation, PKK leader is braving the scepticism of many Turks, and some of his own fighters)". www.aljazeera.com. ^ Özcan, Ali Kemal. Turkey's Kurds: A Theoretical Analysis of the PKK and Abdullah Öcalan. London: Routledge, 2005. ^ Phillips, David L. (2017). The Kurdish Spring: A New Map of the Middle East. Routledge. ISBN 9781351480369. ^ Hudson, Rex A. (2018). Who Becomes a Terrorist and Why? : The Psychology and Sociology of Terrorism. Skyhorse Publishing. ISBN 9781510726246. ^ Butler, Daren (21 March 2013). "Kurdish rebel chief Ocalan dons mantle of peacemaker". UK Reuters. ^ Paul J. White, Primitive rebels or revolutionary modernizers? : the Kurdish national movement in Turkey, Zed Books, 2000, "Professor Robert Olson, University of Kentucky"
^ a b Political Violence against Americans 1999. Bureau of Diplomatic Security. December 2000. p. 123. ISBN 978-1-4289-6562-1. ^ "Kurdistan Workers' Party (PKK)". Encyclopædia Britannica. Retrieved 25 July 2013. ^ Mango, Andrew (2005). Turkey and the War on Terror: 'For Forty Years We Fought Alone'. Routledge: London. p. 32. ISBN 978-0-203-68718-5. The most ruthless among them was Abdullah Öcalan, known as Apo (a diminutive for Abdullah; the word also means 'uncle' in Kurdish). ^ Jongerden, Joost (2007). The Settlement Issue in Turkey and the Kurds: An Analysis of Spatical Policies, Modernity and War. Leiden, the Netherlands: Brill. p. 57. ISBN 9789004155572. In 1975 the group settled on a name, the Kurdistan Revolutionaries (Kurdistan Devrimcileri), but others knew them as Apocu, followers of Apo, the nickname of Abdullah Öcalan (apo is also Kurdish for uncle). ^ "Chapter 6—Terrorist Groups". Country Reports on Terrorism. United States Department of State. 27 April 2005. Archived from the original on 26 May 2005. Retrieved 23 July 2008. ^ Powell, Colin (5 October 2001). "2001 Report on Foreign Terrorist Organizations". Foreign Terrorist Organizations. Washington, DC: Bureau of Public Affairs, U.S. State Department. Archived from the original on 30 July 2017. Retrieved 24 June 2017. ^ "Fiasco in Nairobi". Retrieved 24 May 2016. ^ "Abdullah Ocalan: Is The Famed Kurdish Leader A Double Agent Working For Turkish Intelligence Against His Own Party, The PKK?". International Business Times. 22 February 2013. Retrieved 24 May 2016. ^ "Abdullah Öcalan'ı kim yakaladı?". 10 July 2008. Retrieved 24 May 2016. ^ Miron Varouhakis. "Greek Intelligence and the Capture of PKK Leader Abdullah Ocalan in 1999" (PDF). cia.gov. ^ "Belgenet Öcalan Davası Gerekçeli Karar". ^ "Bir dönemin acı bilançosu". Hürriyet (in Turkish). 16 September 2008. Retrieved 17 September 2008. ^ Argentieri, Benedetta (3 February 2015). "One group battling Islamic State has a secret weapon – female fighters". Reuters. Retrieved 24 November 2016. ^ Lau, Anna; Baran, Erdelan; Sirinathsingh, Melanie (18 November 2016). "A Kurdish response to climate change". openDemocracy. Retrieved 24 November 2016. ^ "A Short Biography". Partiya Karkerên Kurdistan / Kurdistan Workers Party. Archived from the original on 24 September 2015. Retrieved 2 February 2015. ^ Kutschera, Chris (1999). "Abdullah Ocalan's Last Interview". Retrieved 15 October 2013. ^ Kutschera, Chris (July 2005). "PKK dissidents accuse Abdullah Ocalan". The Middle East Magazine. Retrieved 22 December 2008. ^ "HDP MP Dilek Öcalan Sentenced to 2 Years, 6 Months in Prison". Bianet. 1 March 2018. ^ "HDP Urfa candidate, Öcalan: We are a house for all peoples". ANF News. Retrieved 14 January 2019. ^ "Different identities enter Parliament with the HDP". ANF News. Retrieved 14 January 2019. ^ Koru, Fehmi (8 June 1999). "Too many questions, but not enough answers". Turkish Daily News. Hürriyet. Archived from the original on 13 February 2009. Retrieved 22 December 2008. ^ Nevzat Cicek (31 July 2008). "'Pilot Necati' sivil istihbaratçıymış". Taraf (in Turkish). Archived from the original on 9 August 2008. Retrieved 4 January 2009. Abdullah Öcalan'ın İstanbul'dan Ankara'ya gelmesine keşke izin verilmeseydi. O zamanlar Dev-Genç'i bölmek için böyle bir yol izlendi... Kürt gençlerini Marksistler'in elinden kurtarmak ve Dev-Genç'in bölünmesi hedeflendi. Bunda başarılı olundu olunmasına ama Abdullah Öcalan yağdan kıl çeker gibi kaydı gitti. Keşke Tuzluçayır'da öldürülseydi! ^ "Kurdish leader Ocalan apologizes during trial". CNN. 31 May 1999. Archived from the original on 9 December 2001. Retrieved 11 January 2008. ^ Andrew Mango (2005). Turkey and the War on Terror: For Forty Years We Fought Alone (Contemporary Security Studies). Routledge. p. 34. ISBN 978-0-415-35002-0. Archived from the original on 25 September 2015. Retrieved 24 September 2015. ^ "Pro-PKK protesters attack civilians, Turkey captures senior PKK member". Archived from the original on 24 December 2013. Retrieved 12 May 2012. ^ "Batman baby dies after PKK attack, civilian death toll rises to three". Archived from the original on 24 December 2013. Retrieved 12 May 2012. ^ "MFA – A Report on the PKK and Terrorism". Retrieved 23 January 2015. ^ "(unknown original Turkish title)" [PKK Leader Abdullah Ocalan Arrested in Syria]. Günaydın (in Turkish). translated by Foreign Broadcast Information Service. 16 December 1993. p. 72. FBIS-WEU-93-240. ^ Ünlü, Ferhat (17 July 2007). "Türkiye Öcalan için Kenya'ya para verdi". Sabah (in Turkish). Archived from the original on 12 January 2008. Retrieved 18 December 2008. ^ "Öcalan bağımsız devlete engeldi". Vatan (in Turkish). 15 October 2008. Archived from the original on 18 October 2008. Retrieved 15 October 2008. Öcalan yakalandığında ABD, bağımsız bir devlet kurma isteğindeydi. Öcalan, konumu itibariyle, araç olma işlevi bakımından buna engel bir isimdi. ABD bölgede yeni bir Kürt devleti kurabilmek için Öcalan'ı Türkiye'ye teslim etti. ^ "The Argus-Press – Google News Archive Search". Retrieved 24 May 2016. ^ "Text of the Ocalan verdict". BBC News. 29 June 1999. Retrieved 11 January 2008. ^ "Turkey delays execution of Kurdish rebel leader Ocalan". CNN. 12 January 2000. Archived from the original on 26 May 2006. Retrieved 11 January 2008. ^ "Turkey abolishes death penalty". The Independent. 3 August 2002. ^ Luban, David (11 July 2014). International and Transnational Criminal Law. Wolters Kluwer Law & Business. ISBN 9781454848509. ^ "Future of justice, equality and the rule of law". Kurdish advocacy. London: Kurdish Human Rights Project. 21 September 2010. Archived from the original on 2 December 2010. Retrieved 27 November 2010. ^ Villelabeitia, Ibon (18 November 2009). "Company at last for Kurdish inmate alone for ten years". The Scotsman. Archived from the original on 13 August 2011. Retrieved 27 November 2009. ^ Erduran, Esra (10 November 2009). "CoTurkey building new prison for PKK members". Southeast European Times. Archived from the original on 19 November 2009. Retrieved 27 November 2009. ^ "HUDOC Search Page". Retrieved 23 January 2015. ^ "Demonstrations for Öcalan in Europe". ANF News. Retrieved 27 December 2018. ^ White, Paul (2015). The PKK. London: Zed Books. p. 88. ISBN 9781783600373. ^ "Lawyers' appeal to visit Öcalan rejected for the 710th time". ANF News. Retrieved 17 February 2018. ^ "Inhaftierter PKK-Chef: Erstmals seit zwei Jahren Familienbesuch für Öcalan". Spiegel Online. 12 September 2016. Retrieved 14 January 2019. ^ Kurdistan24. "PKK's Ocalan visited by family in Turkish prison, first time in years". Kurdistan24. Retrieved 14 January 2019. ^ Gunes, Cengiz; Zeydanlioglu, Welat (23 September 2013). The Kurdish Question in Turkey: New Perspectives on Violence, Representation and Reconciliation. Routledge. ISBN 9781135140632. ^ Öldürülen imam ve 10 korucunun itibarı iade edildi Archived 8 February 2009 at the Wayback Machine, ANF News Agency, 30 May 2006. ^ "PKK ilk adına döndü". Hürriyet (in Turkish). 9 January 2009. Archived from the original on 11 February 2009. Retrieved 9 January 2009. ^ "TURKEY – PKK steps up attacks in Turkey". Retrieved 23 January 2015. ^ a b "abdullah-ocalan.com". Archived from the original on 6 January 2008. ^ a b Biehl, Janet (16 February 2012). "Bookchin, Öcalan, and the Dialectics of Democracy". New Compass. Retrieved 27 January 2014. ^ "Rayedarên tirk mafên Rêberê KCK'ê Abdullah Ocalan gasp dikin". Archived from the original on 17 March 2008. Retrieved 11 January 2008. ^ a b c Paul White, "Democratic Confederalism and the PKK's Feminist Transformation," in The PKK: Coming Down from the Mountains (London: Zed Books, 2015), pp. 126–149. ^ Enzinna, Wes (November 24, 2015). "A Dream of Secular Utopia in ISIS' Backyard". The New York Times. ISSN 0362-4331. ^ a b "Il Molise per il Kurdistan e per la pace: Castelbottaccio e Castel del Giudice danno la cittadinanza onoraria ad Abdullah Öcalan" (in Italian). Retrieved 22 October 2018. ^ Ocalan, Abdullah. "Democratic Confederalism. Transmedia Publishing Ltd., 2011. p. 21.